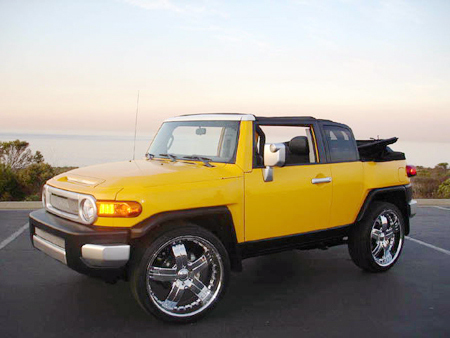 Toyota FJ Cruiser Forum > Toyota FJ Cruiser Discussion > General Discussion > Rig of the month? Well.. We have a best themed photo contest, so why not a best rig contest? Same rules, could be themed.. most rock-ready, epedition-ready, baja-ready, etc. Re: Rig of the month? Location: Near Waco Texas but my mind is in the gutter! You can outrun a Crown Vic, but you can't outrun a MOTOROLA. How about Mike's Pink Warrior? sorry...I'll let it die now. I think if there was a vote on "Rig of the Month", regardless of topic, the same few would continually win. The stock or close to stock FJ would never be a part of it. What would you all think about a "Rig of the Month" on the front page of the forum that is selected for feature, with a brief list of questions that were asked each owner of the featured rig every month? Questions could range from "What type of music do you listen to?" to "What is your favorite one mod?" or anything else we can come up with. There's no point in having this contest since it is widely known that I have the greatest possible FJ. Agreed. Not a good idea from that standpoint. Not bad, though finding criteria to select the rig might be a problem since again, people are gonna pick Air2Air's, Sbechtold's, Shadow's, Uphill's, Doc's etc....over and over. I still say go for it.....kinda like a mini-magazine type article about the specific vehicles mods (might be just like their respective build up threads though)....then archive everything so other users can go back to glean information. I think we would maybe just ask somebody from the forum to spearhead this and select a rig of the month, and mandate that there are no repeats for two years or something. It would be nice to have a registered user do this, and they could forward it on to a moderator for posting on the front page. Thanks for your thought, Sean. I like the archive idea, too.